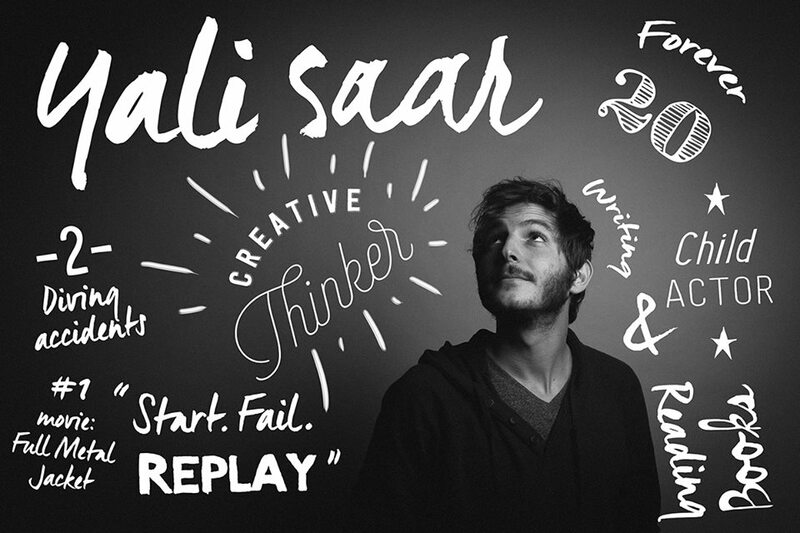 Yali Saar is the CEO and Co-Founder of Algorithmic Branding startup: Tailor Brands. With over 800,000 clients worldwide, TB is teaching computers to design and is set to become the first automated branding agency. Saar is a former journalist, Political Spokesperson and Co-founder of Raising the Bar, a worldwide education initiative with hundreds of members in New York, San Francisco, Sydney and Hong-Kong. Yali has a vast experience in creative marketing and led projects for BBDO, Coca-Cola, TimeOut and Time Inc.
City where you’re from: Tel-Aviv, Israel / NYC, NY. Hobbies: Diving, Swimming, Hiking, Reading, Writing and cooking. Favorite quote: Try, Fail, Repeat. Hey Yali, why did you decide to become an entrepreneur? I don’t think I ever decided – and i’m not sure i’ll ever will. I never decided to become an entrepreneur but rather fell in love with a project and ran with it. My father runs a big marketing company and I remember asking him the same question awhile back. He told me that entrepreneurship is like a disease, nobody chooses to do it but some can’t really avoid it. That is kind of how I feel. I never wanted to be on this rollercoaster yet since I can remember I always found myself working on some odd venture. In high-school we couldn’t get to any club. A normal person would work on their looks (or get cooler friends), we ended up organizing a massive party that evolved into party line that financed all of us for the next few years. For other odd reasons our gang ended up directing music videos that ended up in MTV and building a non-profit that grew to 7 global branches and 300 volunteers. I guess we are kind of addicted towards creating wonders from basics. The obvious answer to this question would be my two co-founders, Tom Lahat and Nadav Shatz, and that moment we decided to work together. But maybe it’s actually the day that a girl I dated dropped me at Tom’s home and disappeared, leaving us to become friends? If we are going that far maybe it’s the day I met that girl? Or the day I decided to go to the same school as her? Influences change as do defining moments, and the things you get in life are the compounded effect of all of those people and events so it becomes pretty hard to attribute outcomes to a single component. It’s kind of like trying to understand how a customer came your way without a very good attribution system. The bottom line is that you should work to live in a present you want to live in and cherish every encounter and event that got you there, good and bad. Tailor Brands is the world’s first fully automated branding agency – powering every idea with the design and creative that WPP gives Coke-cola. With over 800,000 clients worldwide, we are shattering the traditional price vs. quality equation and bringing affordable design, creative, strategy and copy services to SMB’s worldwide. The platform provide our clients everything from logo design to presentations, social posts, banners, printables and more, for a fixed monthly price. Our vision is creating the biggest agency in the world, one that could service every business, big or small, for less than $100 a month. I founded Tailor Brands in 2014 with Nadav Shatz, CTO, and our Chief Designer Tom Lahat. We knew each other for a long time prior and really wanted to work together. One day we just decided to quit our jobs to test ideas. With each new venture we tested, we realized that too much time is spent on creating the brand that was crucial for us to sell the idea to prospective clients and partners. We were intrigued by whether we could find a way to reduce the time we spent working while keeping the quality of the work high. The idea was shattering the traditional equation of value vs. price that was a barrier of entry for many small business owners and projects. Nadav suggested we would try to algorithmically mimic Tom’s thinking process and create a design brain that would could work completely automatically. Tom and myself laughed at the prospects but got down to work. The bet was on, and at the end of that year the first algorithmically designed logo was born. How is Tailor Brands different and unique? What has been your favorite moment with it? What’s the vision? We believe great branding can make a difference. The difference between a small coffee shop failing or becoming a multi-billion dollar franchise. The difference of customers paying $5 or $15 for the sandwich you make. Great branding has always required great budgets, setting a barrier of entry for many projects and small business out there. Tailor was created to empower ideas by enriching them in an automated and affordable way. We use algorithm to create the world’s first automated branding agency, an agency that can democratize everything from design, through copy to creative and strategy. The competitive landscape is built around “dumb design generators”, crowdsourced sites and big agencies that charge by the tens of thousands. Our power is our technology which is getting stronger by the day. Our advice on Facebook is to always use lookalike audiences as the basic interest/geo settings are not good enough on their own. The other thing is to refresh your creative once a week if possible. We currently have dozens of creatives in circulation. Dozens of times. And I don’t know any entrepreneur that would say otherwise in an open 1-on-1. I remember when we just started out I needed to raise funds and I was so bad at it! It was our first business and we didn’t have any experience in the startup world. We had zero connections and all of the materials I’ve read online didn’t seem to be enough. I sent a hundred cold emails, and got at least 20 in person no’s. We were pathetic and at one point a VC stopped a meeting and started sketching terms on an eraser board for us. It got to a point I was so stressed that I started passing out randomly, but at the same time I felt like i’m fighting for life or death so I had no other option but pushing. Then came the first yes, and then the second, and the third. When we needed to raise our 2nd round it was already a piece of cake (we have been very fortunate and lucky since in that sense). Regardless of what happens going forward these experiences taught me an important lesson: Always fight like your life depends on it, and keep in mind that “no” is part of the game so there is no need to panic. I remember sitting with a three other founder friends; one was just starting out, and had a small company of seven people, the other was an intermediate, and had a team of 100, the third was pre-IPO with around 500 people working there. The new guy told me he reached out to one of our investors and he turned him down. I told him that I can cover a wall with all of the no’s I got. The intermediate and pre-IPO guys looked at us and laughed, the first said he could fill a room and the latter said he could fill his entire house. We tend to celebrate our successes a lot but not laugh about our failures enough – there is so much more to learn there. We all know nothing, just like John Snow. And that is why people invented A/B test systems. If you and your partners/team have conflicting assumptions, don’t spend time arguing, just test and see who is right. Here is a framework to better A/B test your assumptions. How do you evaluate your A/B tests results? While working on your startup, have you come across any interesting bit of knowledge that you’d like to share? Having a goal you actually believe in and love. Success is never guaranteed, regardless of how good is your idea. You are going to think you are about to fail, you are going to hate your product, you are even going to hate your co-founders from time to time, but you have to have something that keeps you on your ship even if it seems it sinking at times. That is why loving and believing your goal is not a pep-talk advice, it’s crucial to your survival. The Count of Monte Cristo, The Myth of Sisyphus, a hundred years of solitude. Being the world’s largest branding agency – and if Elon Musk approves we are willing to take on Mars too.